As some of you may recall.. mom has dementia and she no longer can sew. My boys are in Air Cadets. On the nights and Saturday’s that they are at cadets I go sew with mom.. Its been a while as at he end of February we found out that mom was accepted to move into the senior lodge.. So had to help pack move and unpack..Well this saturday boys had Fitness Challenge from 9 to 3 so i grabbed my box of charm squares that were left in my bin and some of the blue fabrics yardage and FQ’s that I inherited in her move. 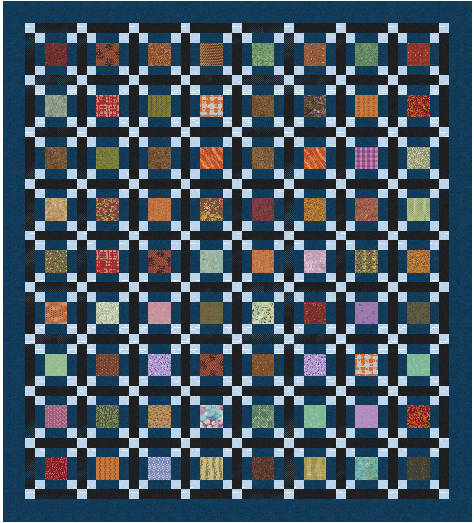 When i got there She would press the fabric pieces flat as I cut 2 1/2″ strips subcut into 5″. Then I sewed them to one side of the charm square.. I pulled out all the real bright ones that were there to leave all the fabrics fairly muddied (toned down) colors.. We sewed from 930 to noon and again from 2 to 3. We got so much accomplished… 9 rows of 12 charms. When I got home I started to play with my EQ8 to figure out how to get a decent size quilt from this.. I could add just the same patch with corner-stone but it didn’t speak happy to me.. I played till i got this 8″ finished block then added 2″ sashing and 2″cornerstones to it. Woah… this is way too big… its measuring 96×128 ill be ripping out a few seams so that my layout will be 8×9 so the quilt with a 5″ border will measure 95 x 105 room to fold over the pillows. Here are the fabric requirements.. I turned all the charm squares to one color for to make it easier to know that 72 charm squares are needed.